Tony Q. has been playing the saxophone for 33 years and has been performing professionally for over 20 years. Having been recognized for his exceptional ability many times throughout his musical career, Tony studied at the Berklee College of Music as well as privately with John Payne, Bill Thompson and Dennis Taylor. He began his career working with the popular local Boston R&B/Motown act "Sally and the Sophisticatz" throughout 80's and later continued with such bands as "The Wrecking Crew," "The Whitewalls," "The Big Bad Wolf," "The Swinging Johnsons," "Something Blue," "The Love Dogs," "Blue Heaven," "The Bruce Marshall Group," "The Feel," "Comic Strip," and "Clutch Grabwell." In addition to performing as part of these rock, r&b and blues groups, Tony formed his own jazz group "Q'd Up" which performed in several jazz clubs in the Boston area for over 2 years. His performances have played a part in opening acts for such well known artists as "The Beach Boys," "John Pousette-Dart," "Wilson Pickett," "Junior Walker," "Eddie Money," "Average White Band," "America," "David Cassidy" and "Johnny Winter." He has also performed on stage with late great blues legend "Clarence 'Gatemouth' Brown." Tony also performed with "Amy and the Hank Sinatras" at "Vic's Kangaroo Café" in New Orleans and was invited to join the group at the New Orleans Jazz Festival. He is currently involved in many developing musical projects in the Las Vegas area and also returns to his native Boston area several times during the year for certain special appearances. 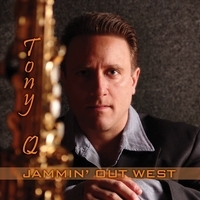 Tony Q. brings a positive, crisp and passionate jazz-flavored funky groove to every performance. His most recent recording endeavor "Jammin' Out West" covers a wide variety of musical styles from sweet ballads to rock to funk and includes original music co-written by Tony and long-time friend and bassist Ray Sadolsky. Pushed "repeat" and listen whenever I'm in my car! Tony Q's latest CD is a treat!! I blast his music as it makes my heart feel so good and puts a smile on my face ! He plays with such feeling and emotion that listening to his CD is addictive! Thanks, Tony! !